The practice of acupuncture has been used for centuries as a way to naturally alleviate pain and treat a variety of medical conditions in humans. Today, we are able to use this same ancient treatment modality to manage the ongoing health of our animal companions. Prairie Side Veterinary Hospital is proud to offer this additional option as a way to help our valued clients provide more holistic and well-rounded care to their cherished pets. 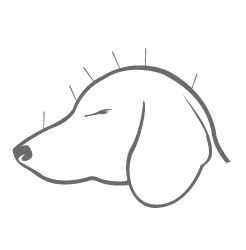 Veterinary acupuncture is a drug-free, virtually painless way to help your pet live a healthier, more comfortable life. Acupuncture involves the gentle insertion of tiny needles into various areas of the body known as acupoints. These acupoints are known to be directly related to other areas within the body, such as muscle groups, nerves or internal organs. When the needles are strategically inserted into these acupoints, it causes a cellular response in the area being targeted and triggers the body’s natural healing and pain management mechanisms. Our animal companions are believed to possess upwards of 170 acupoints, making this practice highly effective with excellent results. Does your pet suffers from any of these conditions? Or just generally seems to be experiencing pain or discomfort? Acupuncture may be beneficial in alleviating pain and improving quality of life. The results from acupuncture can often be seen almost immediately. However, the number and frequency of treatments your pet will require for optimum results will depend on what is being treated and a variety of other factors that are specific to your pet. Our highly skilled, experienced doctors will advise you on your companion’s particular treatment regimen once he or she has been thoroughly assessed and evaluated. If you believe your pet is in pain, don’t wait another moment. Give us a call and find out if veterinary acupuncture can help them to live a more happy, comfortable life. We are a Kenosha based veterinary hospital providing full service medical care, wellness checkups, and nutrition and weight management. Copyright © 2019 Prairie Side Veterinary Hospital.